Aplacophora (the name means “without plates”) is a small group of marine molluscs with only about 320 species. They are found burrowing at the bottom of all the world’s oceans. 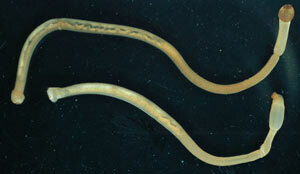 They are small (most less than 5 cm long), cylindrical and worm-like and do not have a shell. Instead of a shell, their skin contains tiny spikes (spicules) made from calcium carbonate which is secreted by the mantle, this gives them a beautiful shine. Most of the Aplacophora do not have a foot and the head has no eyes or tentacles although they do have a simple radula. They are either carnivores (mostly eating Coelenterates) or eat detritus.